70804 makes its first revenue earning run, passing Romsey with 6V31 16:39 Eastleigh - Westbury. 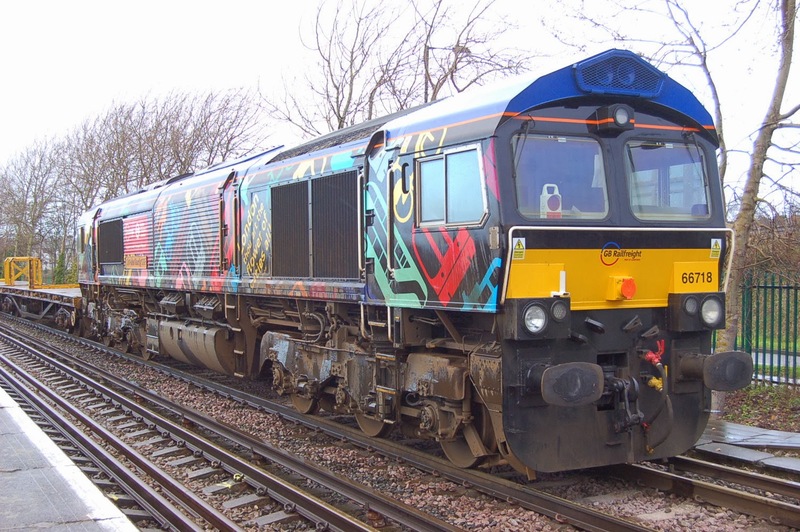 This will have now place 70804 in Westbury. 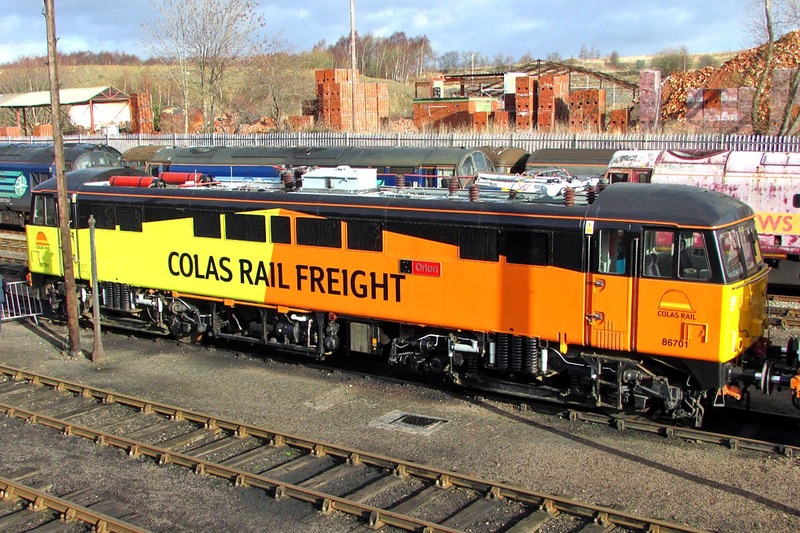 More on Colas 70 workings in a forthcoming update. 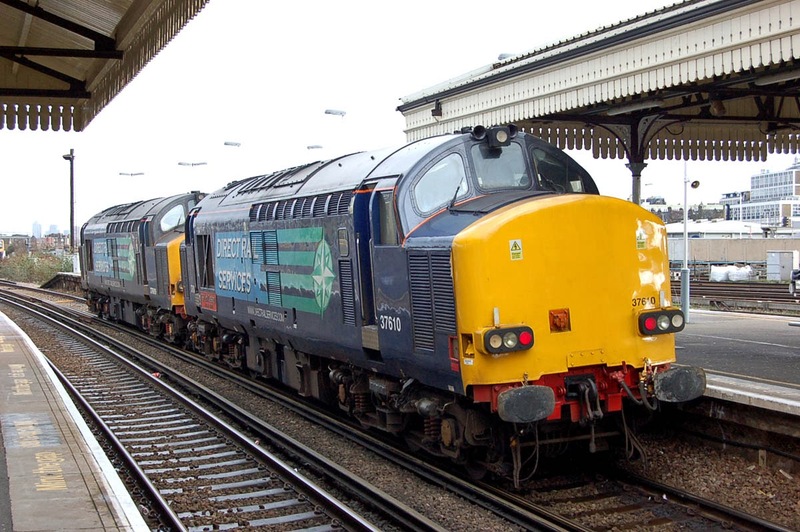 31452 and 31190 top and tail the Railvac working as 6Z32 10:20 from Peterborough to Totton, running 1 hour early. 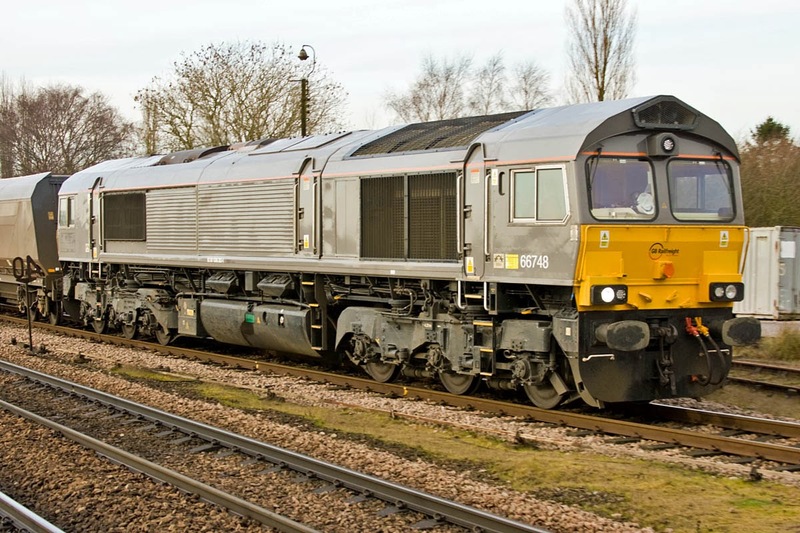 70015 was already spotted last week making its first visit to Southampton following transfer from Heavy Haul. 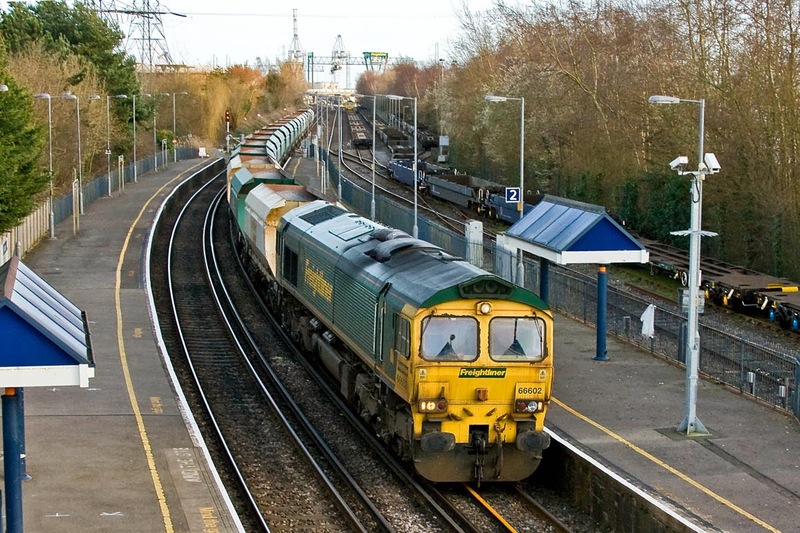 66602 rolls through Redbridge with the 6O49 empties from Theale to Wool. 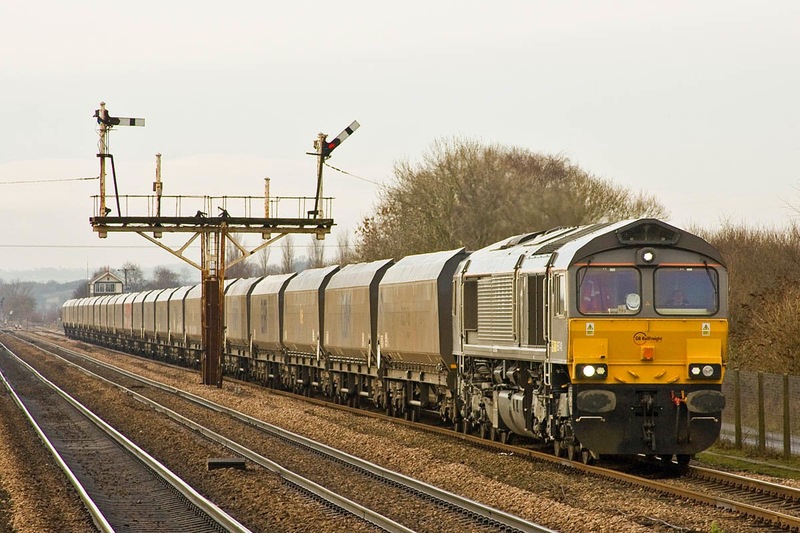 66016 + 66087 formed the 0X12 12:44 Alexandra Dock - Eastleigh, passing Romsey. 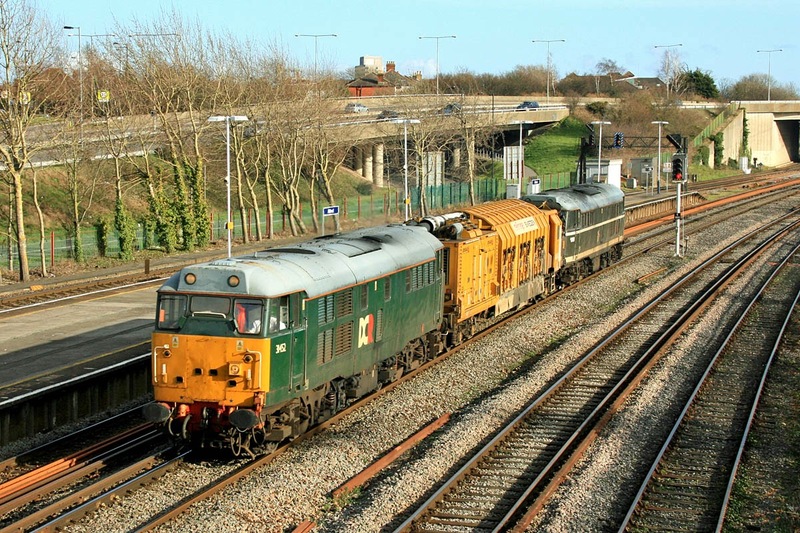 56302 passes through Romsey with 6Z30 on 21st February. 56302 was previously 56124, new from Crewe in September 1983, named Blue Circle Cement in October of that year. Withdrawn by EWS in June 1999 as due for works attention. 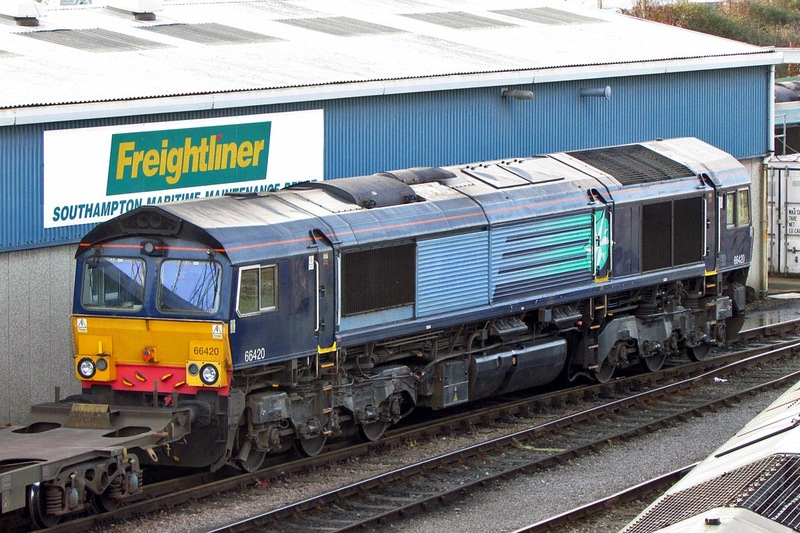 Returned to service as 56302 for Fastline in April 2006, and sold to Ed Stevenson in 2010 follow the demise of Fastline. 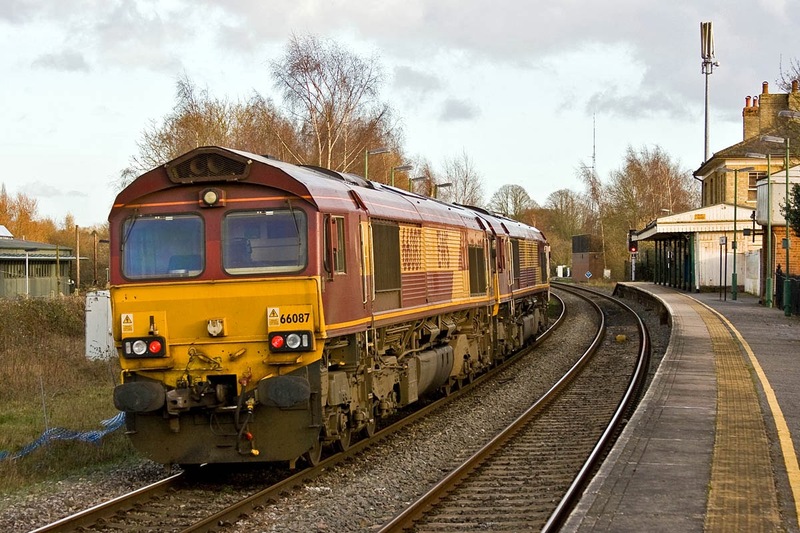 Into Colas service from November 2012. 37610 T.S. (Ted) Cassady 14.5.61-6.4.08 + 37609 0Z37 11:57 Hither Green Down Reception to London Waterloo driver trainer passing Clapham Jct. Over at Kings Cross, 91110 Battle of Britain Memorial Flight awaits a northbound departure. 70801 is seen leading 56302 at Test Lane, it's first working as lead locomotive. Image by Ian Knight. Saturday, 18th February 1984. Elsewhere in the country, then very much in the analogue world, I did find this rather good video of 40024 on the Dore-Mat railtour, which is logged here, and there are some further pictures one two. England played Ireland at Twickenham, score 12-9. 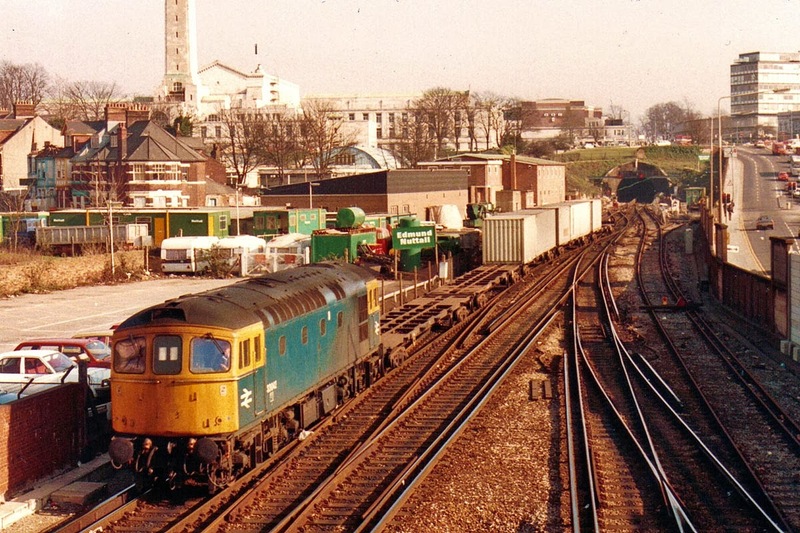 4-REP 3009 with a 91 service, a Weymouth - Waterloo fast train. The second car appears to be the TBFK, so the lead car will be DMS 62157, which entered traffic new in July 1967. 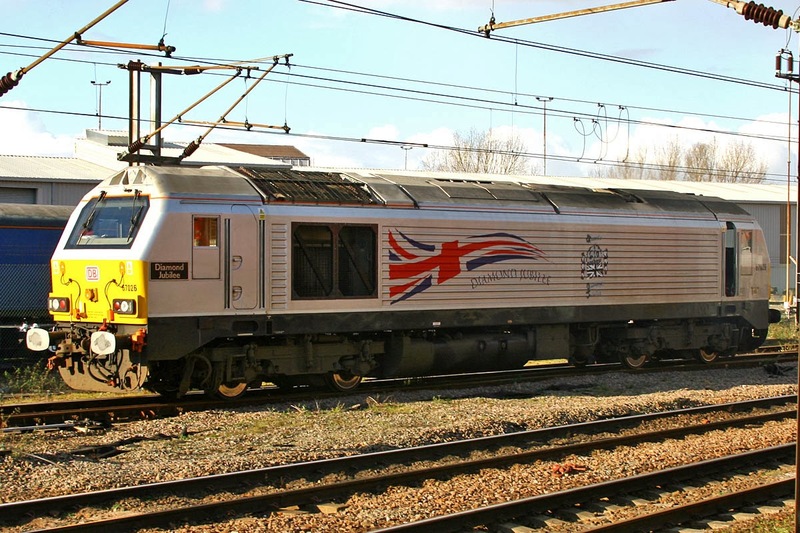 The unit was renumbered to 2009 in June 1986, and withdrawn in June 1987, after which 62157 was scrapped at V Berry, Leicester in June 1990, having given up its motors to a Class 442. The TBFK 70809 was built as CK S15893 in 1956 (Metro-Cammell, to lot 30222) and converted in 1967. After 2009 was disbanded it ran in 4-TC 2805 for a short period only in June 1987, then was scrapped at Berry's in March 1990. 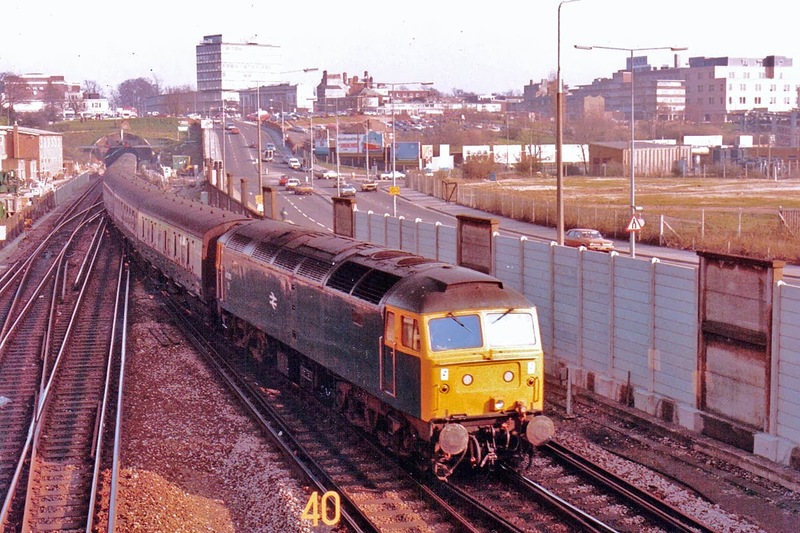 33042 approaches Southampton Central with a Freightliner train, likely heading for Millbrook. At this time only the down road was available in Southampton Tunnel while Edmund Nuttall were engaged in an extensive programme of repairs. 33042 was new as D6560 in July 1961, and stayed in traffic until October 1996, being broken up in January 1997 by MRJ Phillips at Stewarts Lane. 33108 with what appears to be Eastern Region Mark 2A stock, so possibly a Poole to Newcastle, which would normally have been in the hands of a Class 47. 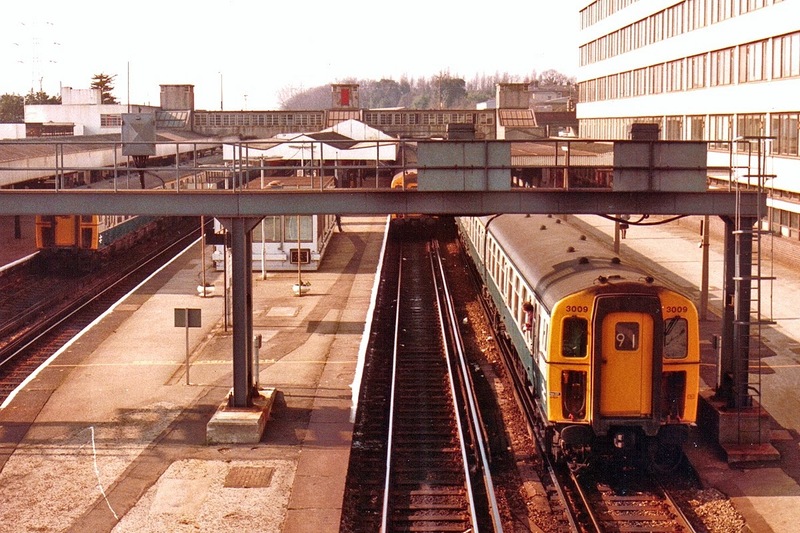 Alternatively, it may have been a divert to Waterloo from Exeter. 33108 was new as D6521 in September 1960, and was withdrawn in May 1993, after which it worked for Fragonset until December 2003, and is currently preserved at Barrow Hill (where I saw it only a week ago). 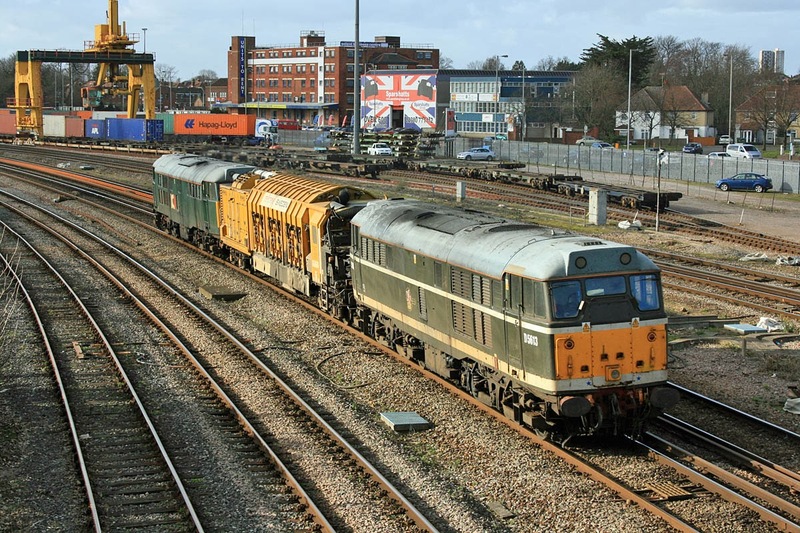 47503 enters Southampton with a cross-country service to Poole. The locomotive was then only 17 years old, being new in July 1966 as D1946. 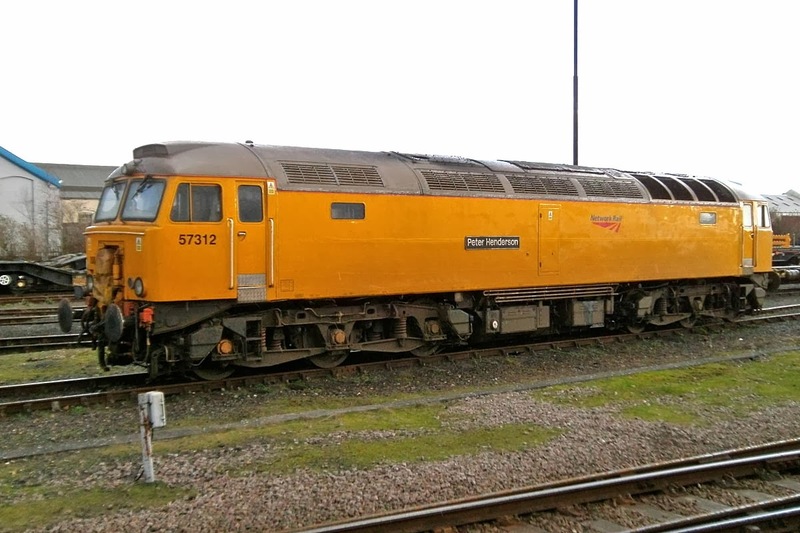 In June 1994 this became 47771, later withdrawn in April 2003, and moving into preservation at the Colne Valley in June that year. Having returned to Romsey, 50026 Indomitable passes with a divert from Exeter and Salisbury to Waterloo. New in June 1968, the locomotive had been refurbished re-entering traffic on 6th December 1982, and was later withdrawn in December 1990. 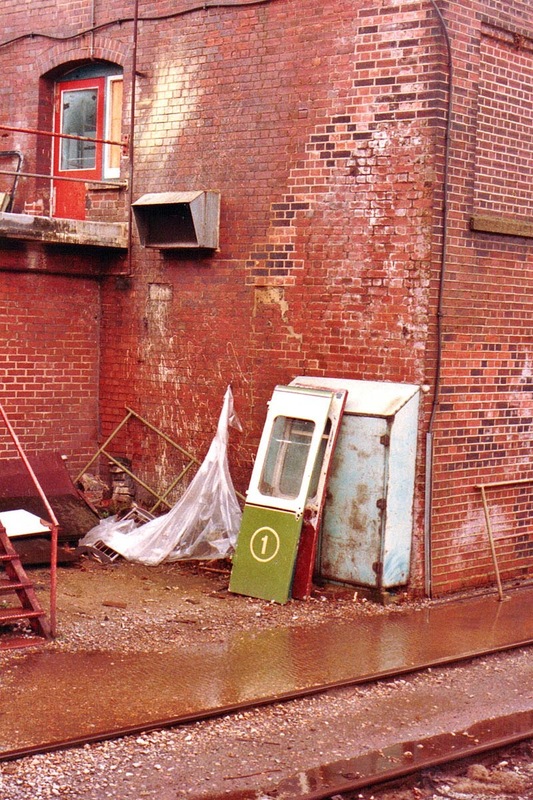 It spent a period in 1992-93 in Booth's scrapyard at Rotherham from where it was rescued. 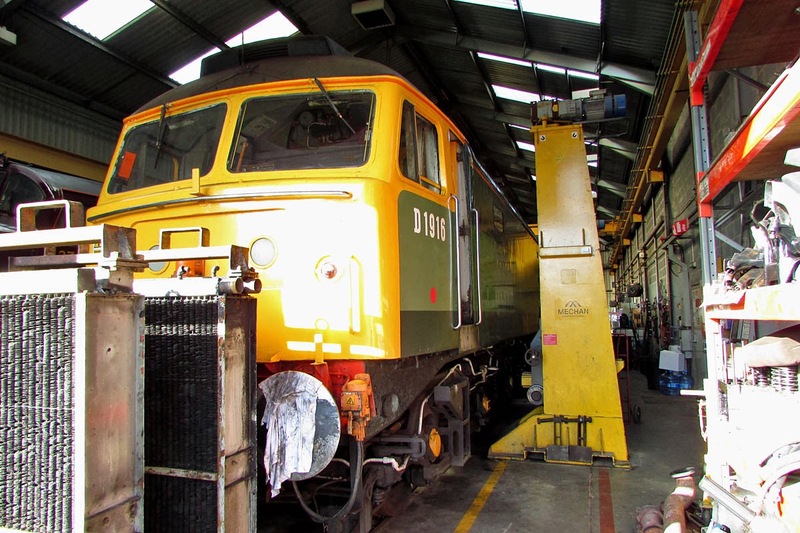 Since 2012 it has seen some use on the diesel gala circuit, and currently it is receiving attention inside Eastleigh Works. My spotting notes plus later history. 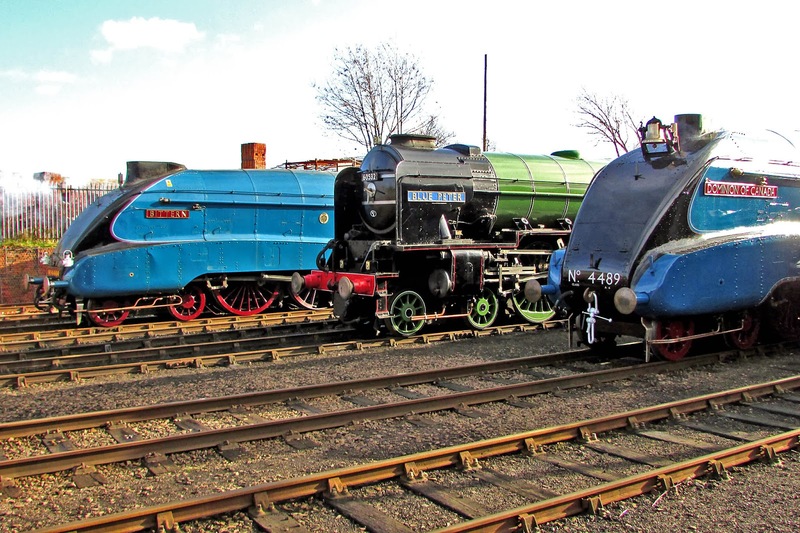 A lot of now preserved stock was seen in one day. 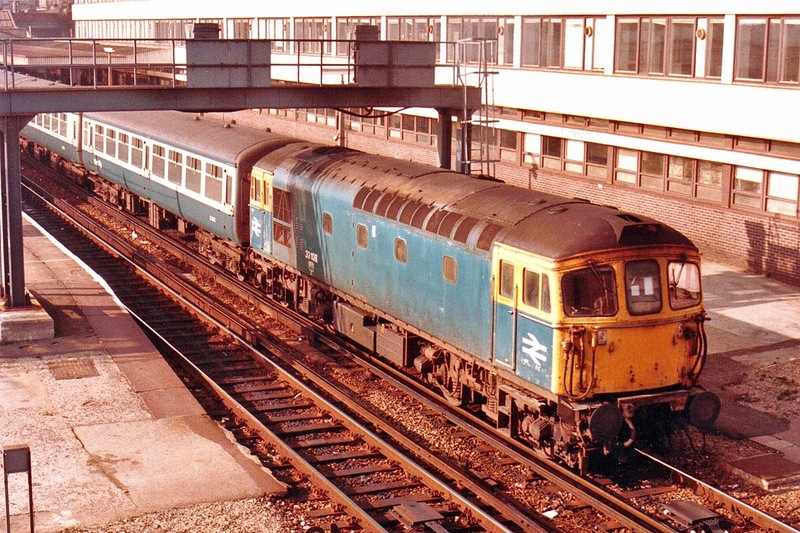 In the midst of the BR Blue era, when the only colour schemes were all over blue or blue and grey, these two Mk 1 pattern doors were seen through the fence at Campbell Road. 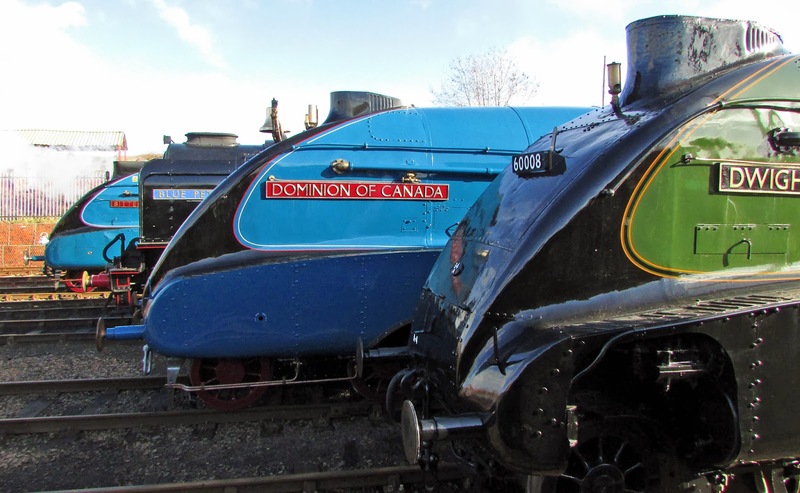 One was a green and cream, with the first class indicator in a circle, and the other a more battered red. I think that they were around here for a few weeks. Does anyone know what the reason was for these? My email is at the bottom of the page. 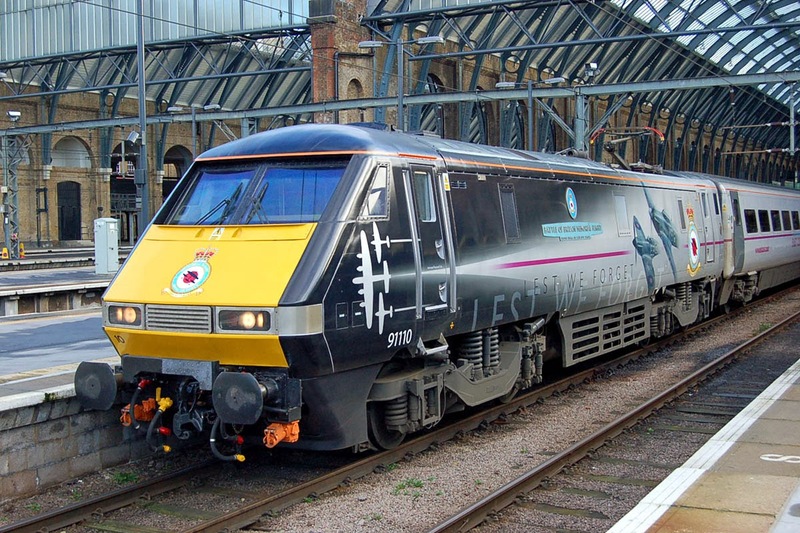 UPDATES: It matches the West Highland LNER Tourist Livery, but that rake was painted a year later in 1985, and the number style does not match. Apart from paint trials, the best suggestion so far is that these may have been from the Exhibition Trains unit at Salisbury. Your input remains welcome. Two images from Chris Finch. 47818 outshopped (for the last time?) with a modified cooler group, and filled in headcode boxes, as favoured by DRS. The cat with nine lives. 57312 Peter Henderson after working civil engineering workings overnight on Friday night. 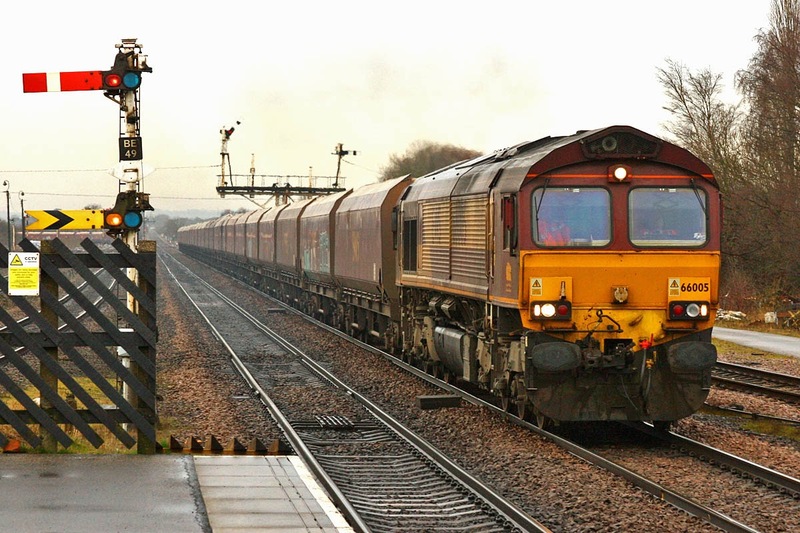 First time visitor 70015 with 4M55 from Millbrook - Lawley St, Tuesday 11th February. Image by Ian Knight. 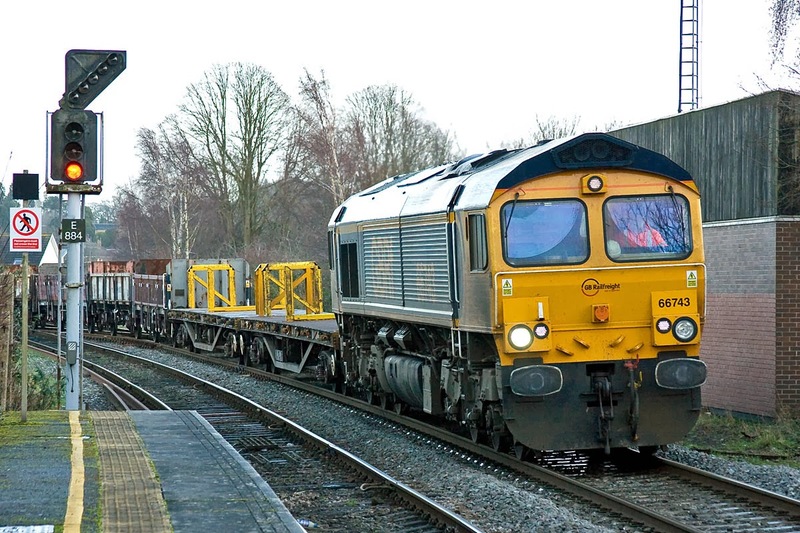 66718 Sir Peter Hendy CBE at Millbrook, during engineering possessions, Saturday 8th February. Image by Ian Knight. A larger gallery is available at SkyDrive. Right click and 'open link in new tab' for larger versions of the pictures below. GNR Class C1 No. 251, completed at Doncaster in December 1902. 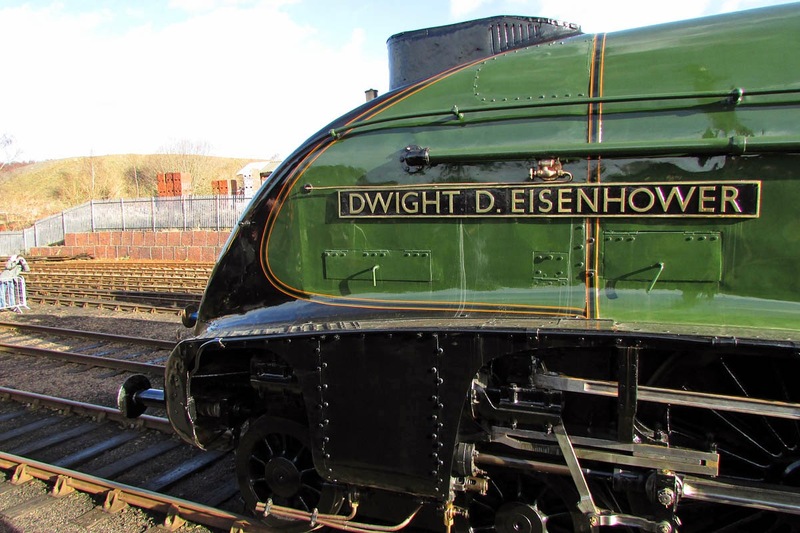 Front of 60008 Dwight D Eisenhower, soon to return to Green Bay, WI. 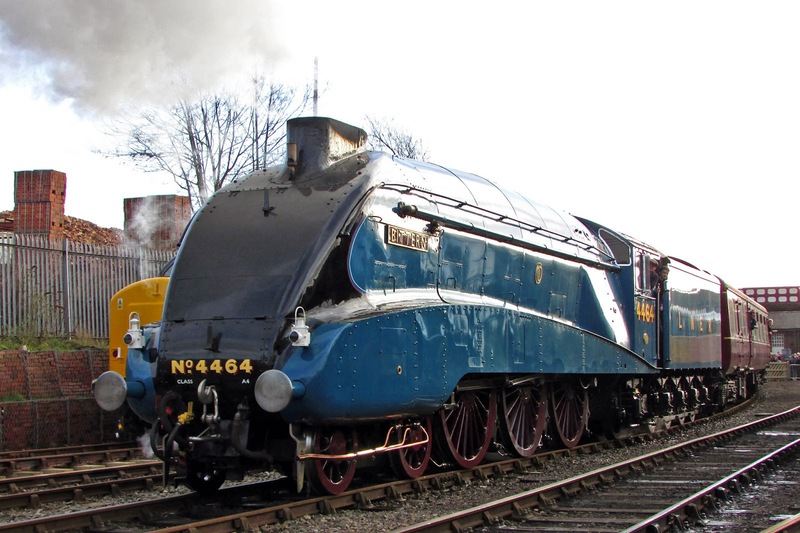 4464 Bittern on a demonstration line shuttle. It has a new LNER style plaque, unveiled in the days preceding the event. 4464 on another shuttle pass. 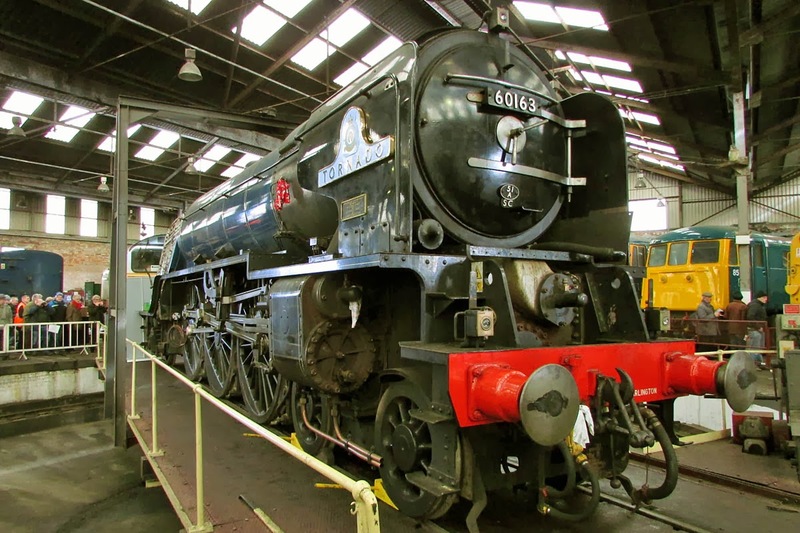 60163 Tornado is receiving winter maintenance, where the cab has been removed for access to the firebox area. 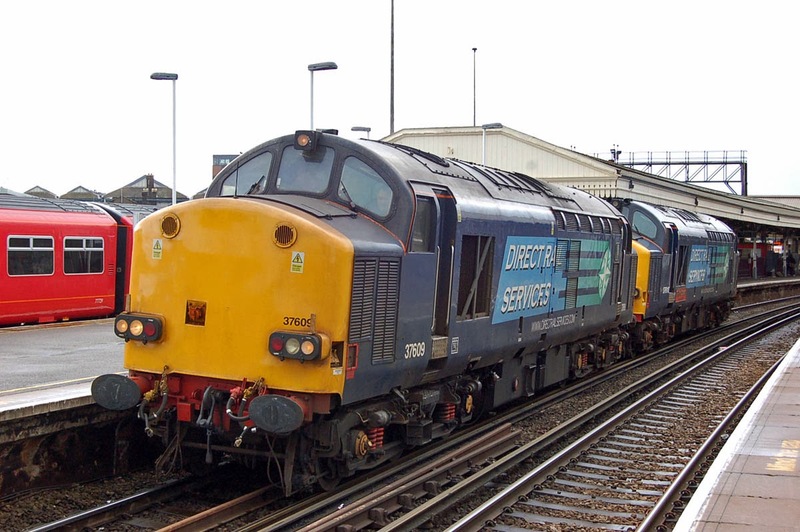 There is a larger set of diesel and electric pictures on Skydrive. 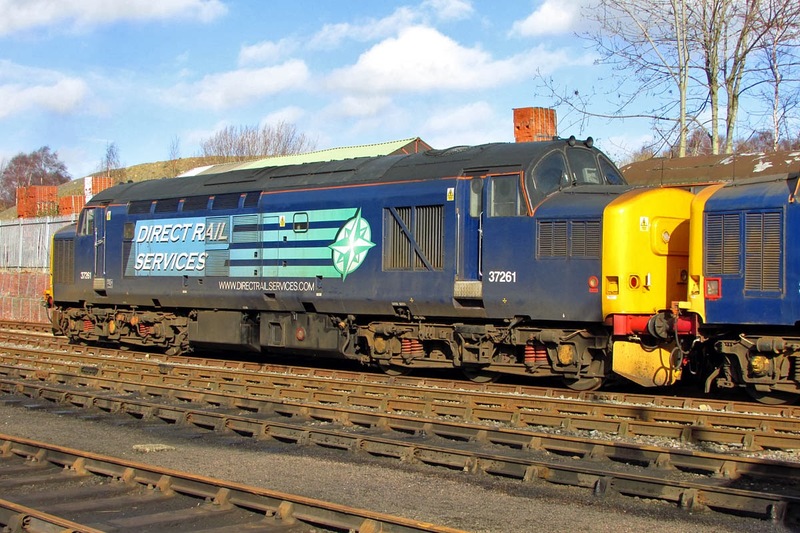 37261 is stored XHSS, and worked its own way to Barrow Hill on 20th January. It is understood that the locomotive is due for works repair, and will be stripped instead. 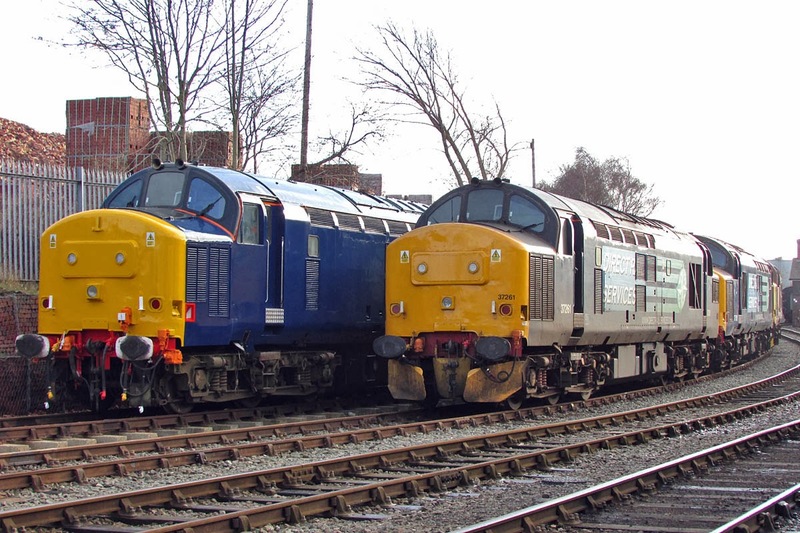 37422 was alongside, and is understood to be sitting on scrap bogies. 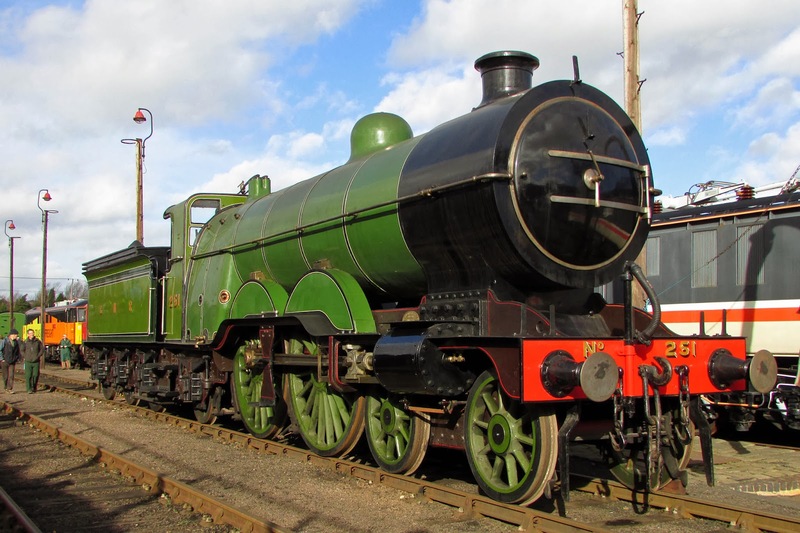 This locomotive was in Glasgow Works for overhaul activities, and was transferred by road to Barrow Hill arriving on 8th January for attention from HNRC. The bogies appear to have been changed in the past month. HNRC 37503, with 37521 beyond. 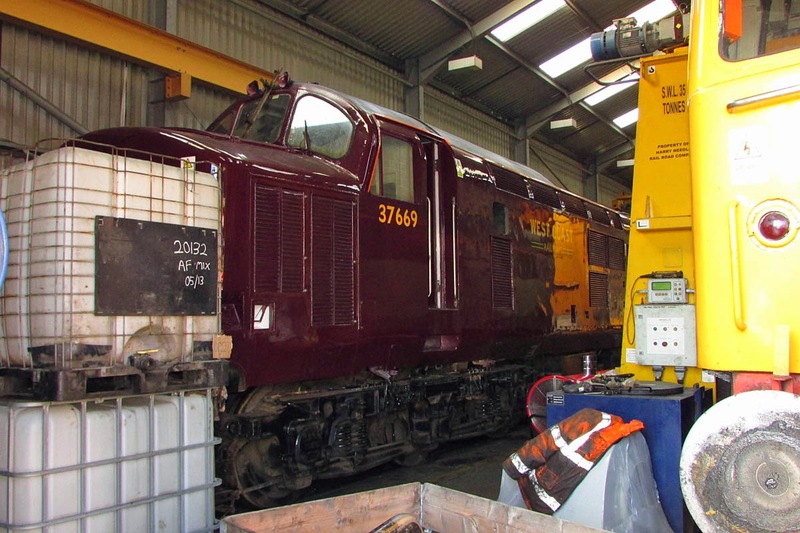 West Coast's 37669 was delivered to HNRC on 14th November, by rail transfer from Carnforth. 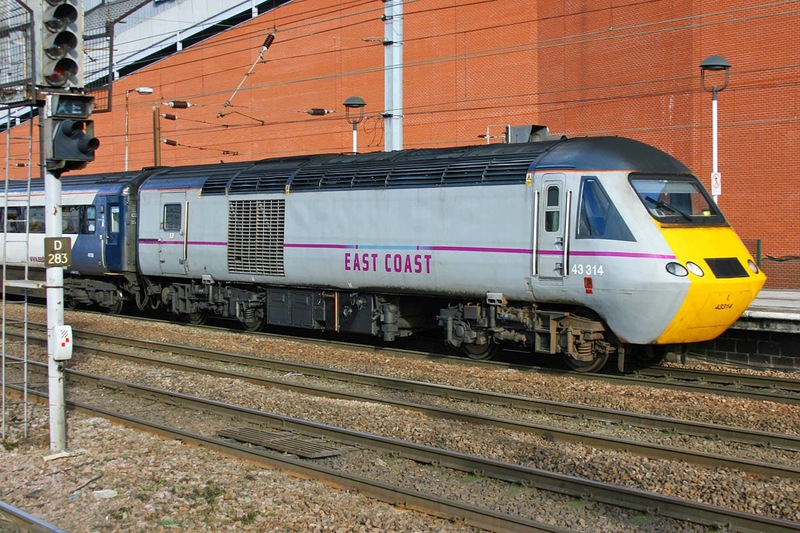 Once completed, this is a new restoration to traffic for West Coast, following acquisition from DBS in March 2011. 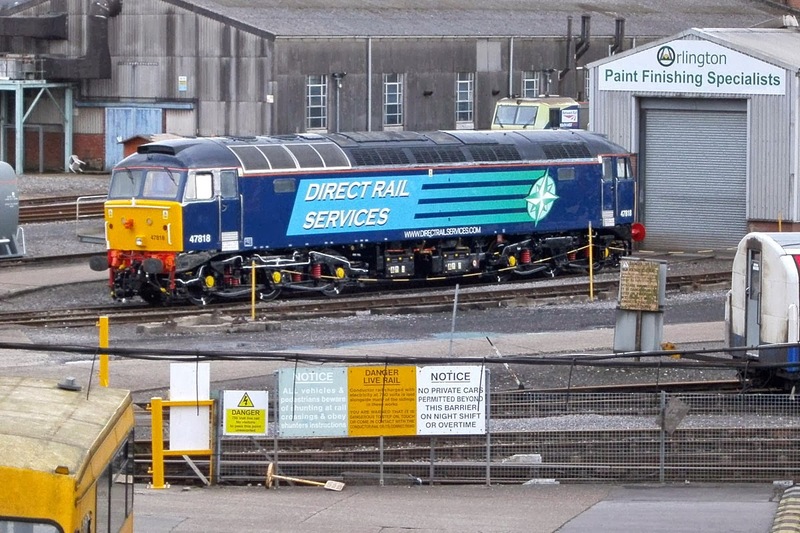 47812 (D1916), once Pride of Eastleigh, is currently being repaired by HNRC for GBRf, having arrived with 47843. 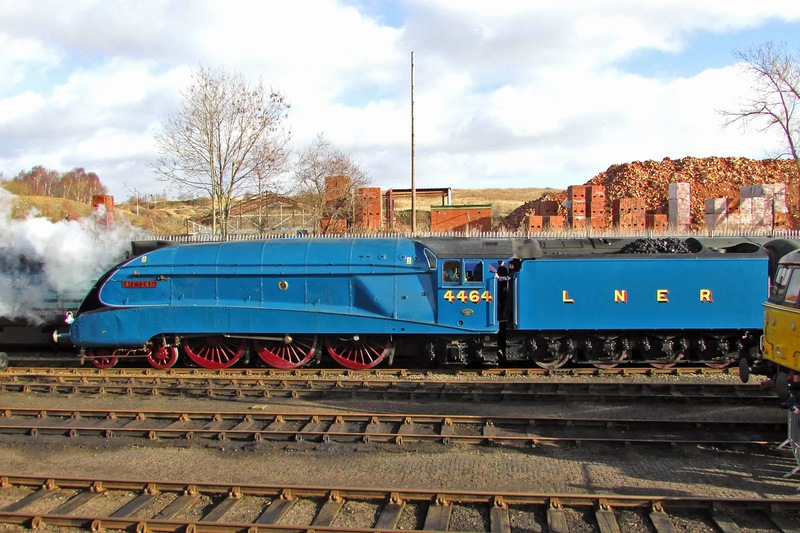 This loco was at Eastleigh until mid-November, and did have at leastone run on the 'Torbay Express' in 2013. 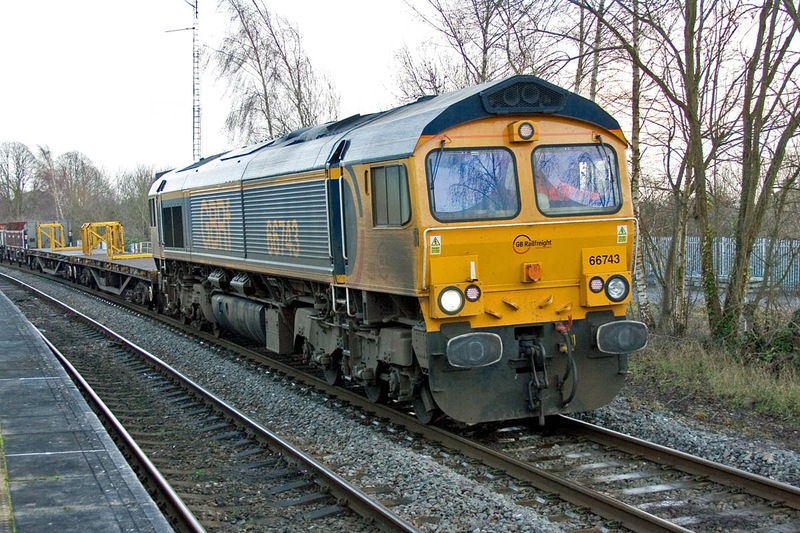 Similarly hired 47843 was noted at Doncaster Decoy earlier in the morning, having re-entered traffic. Europhenix 86701 Orion is in storage, along with 86702 and 86213 of ETL. After Barnetby, it was onwards to Doncaster. However services were in some disarray following an overhead line incident in the Huntingdon area, reportedly caused by a foil balloon. 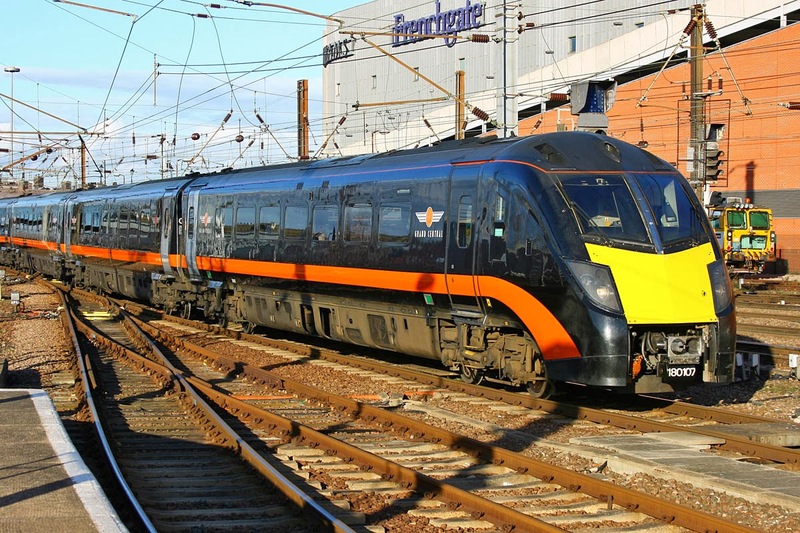 As a consequence, limited services to and from Kings Cross were running with HSTs. 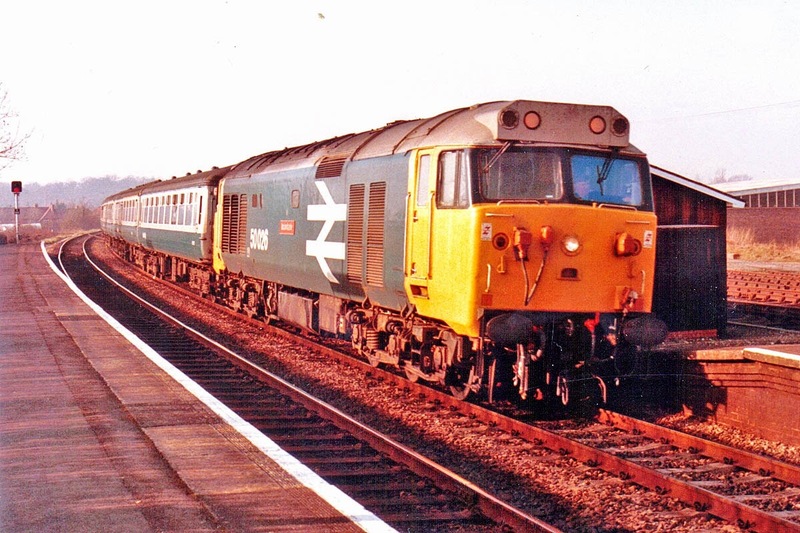 43314 (Crewe, March 1979) arriving with 1E11 07:52 Aberdeen - Kings Cross. 67026 Diamond Jubilee was started, and departed southwards as a Thunderbird. 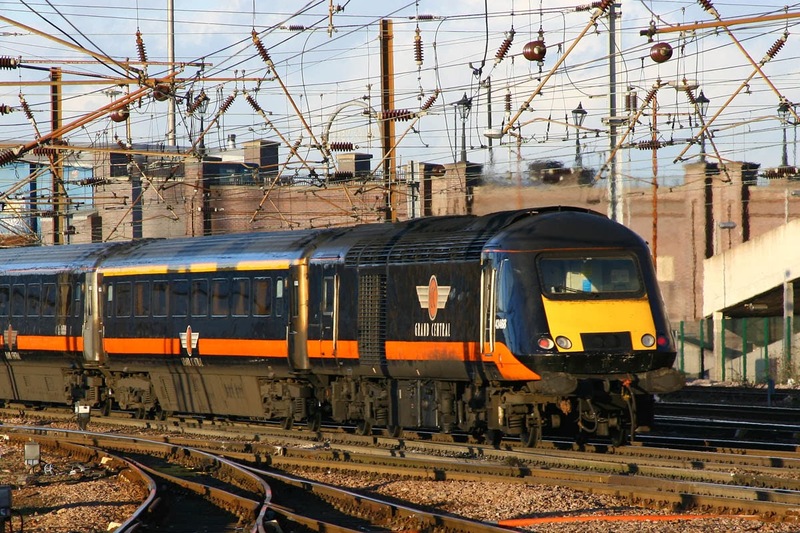 180107 Hart of the North is moved into a platform, following the termination of a 5A63 13:50 Peterborough - York. Four morning hours at Barnetby. The Santon ore trains were not running, although they resumed on an afternoon shift, after I had moved on. 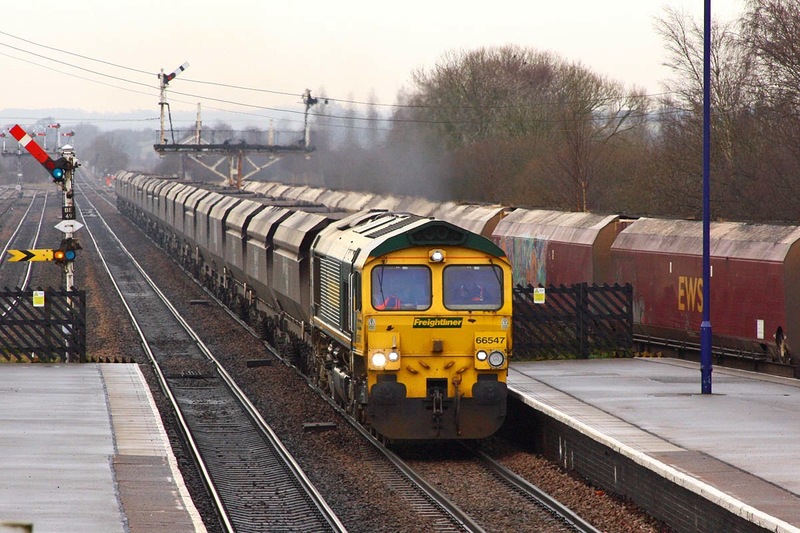 No Class 60s were seen, the oil trains to and from Kingsbury were in the hands of 66063. 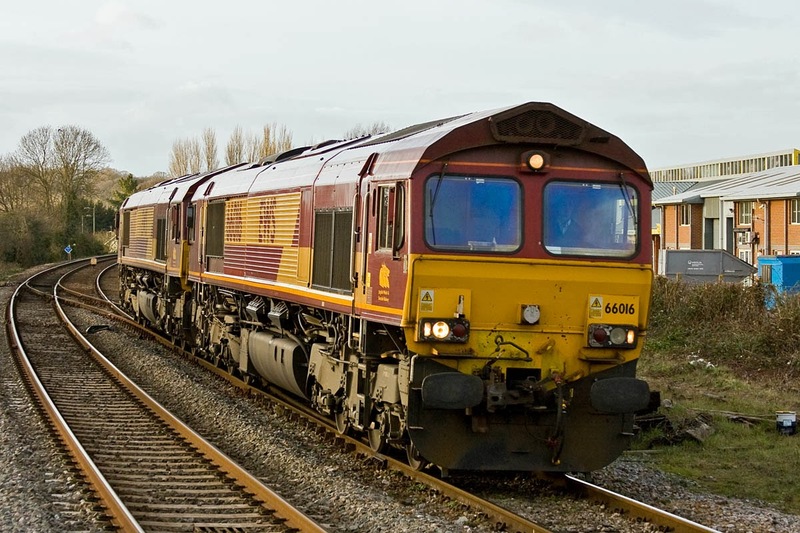 'EWS' 66005 leads 06:52 Worksop - Immingham coal empties (STP working). 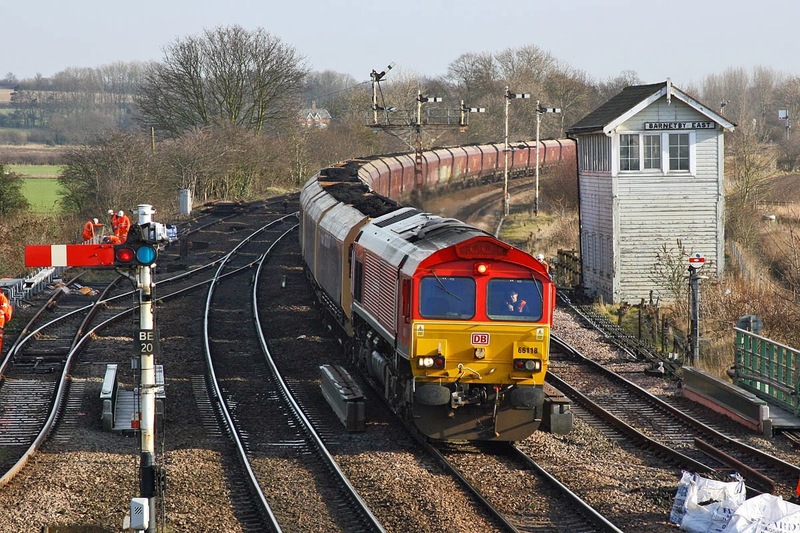 66118 in DB Schenker red at the front of 10:14 Immingham - Drax (STP working). 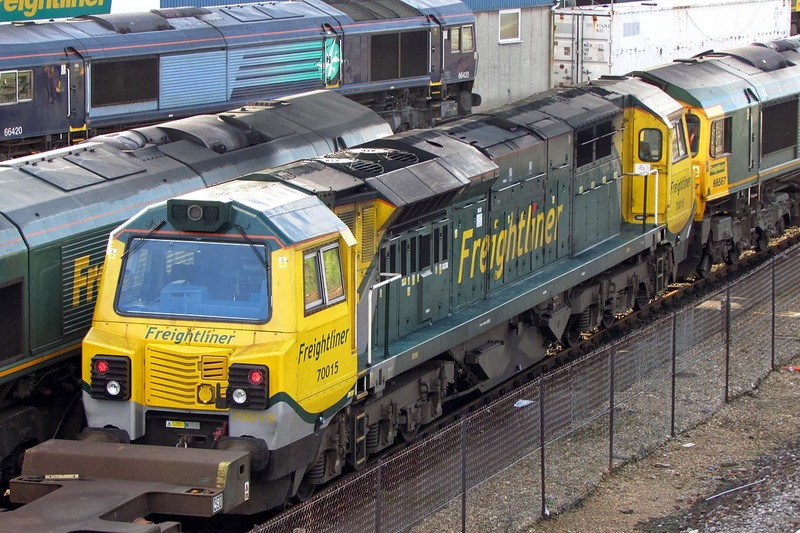 Freightliner 66547 with 4R12 07:12 Drax - Immingham. 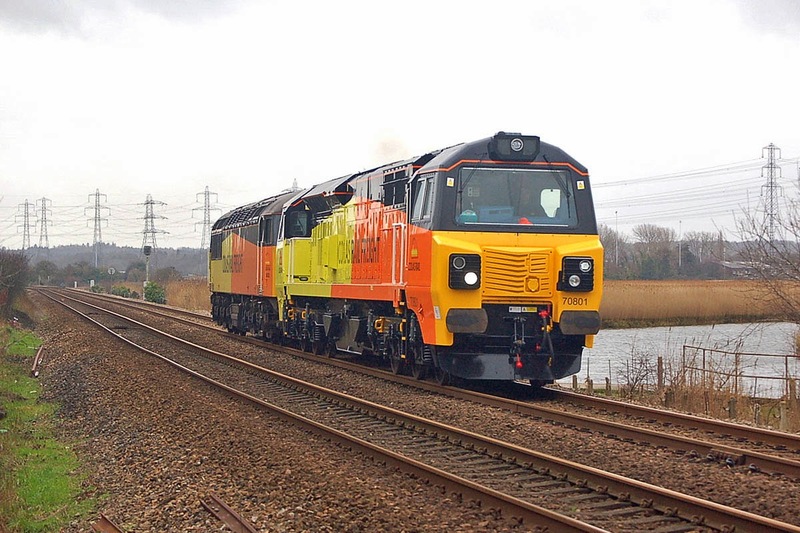 GBRf 66720 in its unique rainbow colours, 09:50 Doncaster Down Decoy - Immingham (STP). 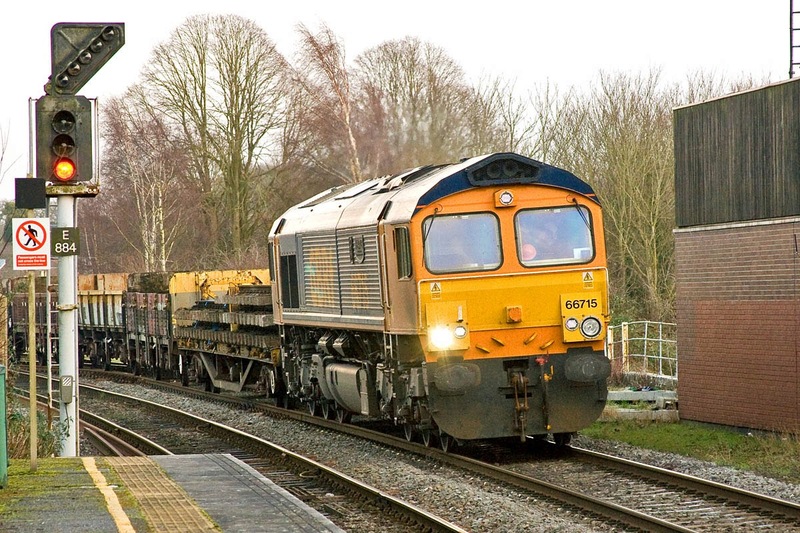 GBRf 66748 approaches Barnetby with 09:00 West Burton - Immingham. 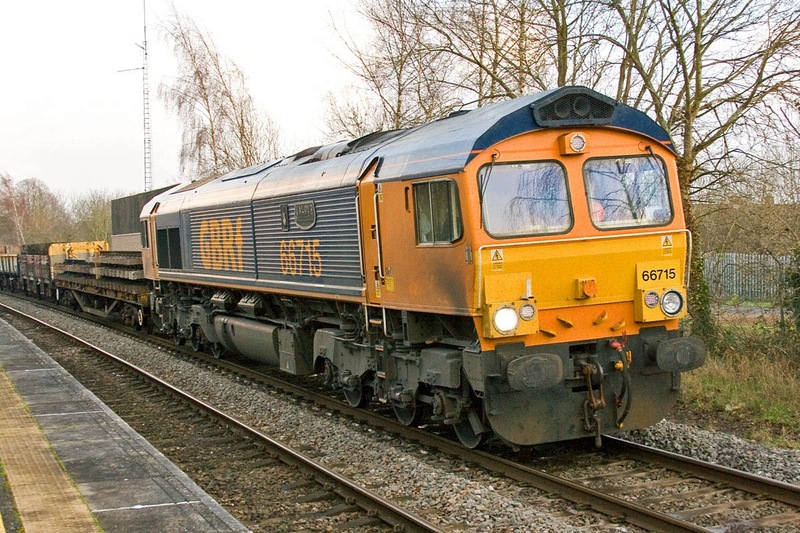 GBRf 66711 passes Barnetby East with 6C09 08:45 Immingham - Eggborough, running over two hours late. Work continues to eliminate the semaphore signalling, so please admire the signals at Wrawby Junction while they are still in operation. Lines lead to Lincoln, on the left; Brigg & Gainsborough, up the gradient in the middle, and to Scunthorpe on the right. Wrawby Junction signalbox is a listed building, although Barnetby East is not. This picture should introduce a group of pictures forthcoming from an excursion to Yorkshire, Lincolnshire and Derbyshire. 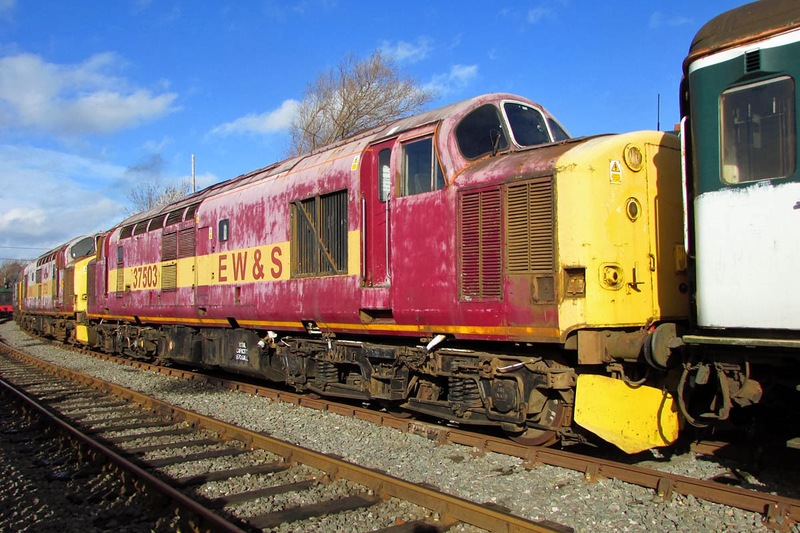 There should be further coverage tomorrow, then maybe more next weekend - the diesels will likely be posted first. 66743 approaches Romsey with 6G14 (Redbridge -) Romsey - Laverstock - Woking - Eastleigh, working wrong line until the crossover seen in the background. 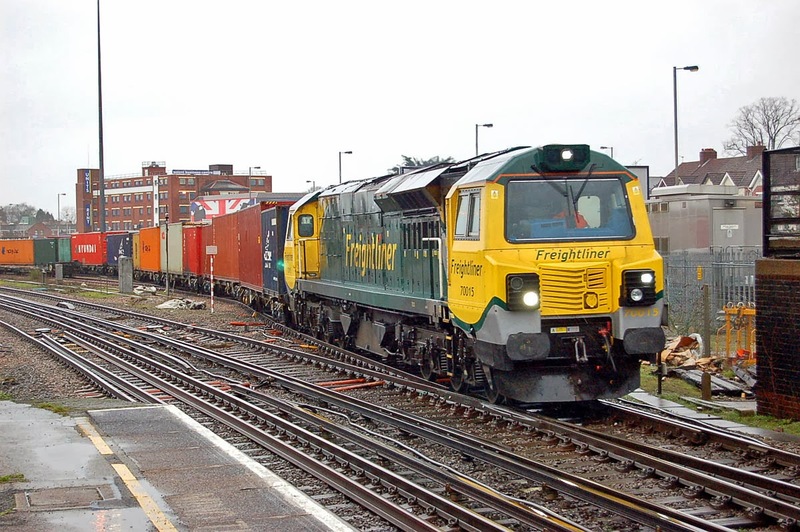 66743 was new as DRS 66407 in 2003 and was hired by Freightliner for some months in 2006. 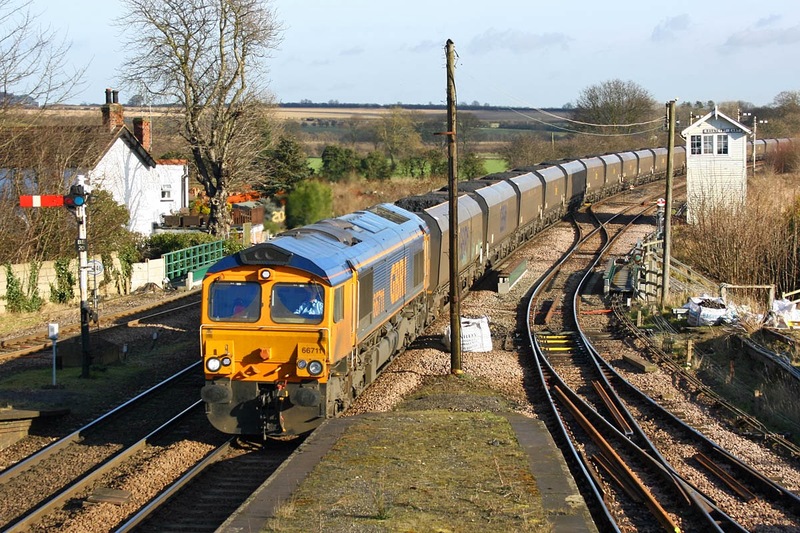 For a short while in 2009 was Advenza 66842, then on to Colas and then GBRf. 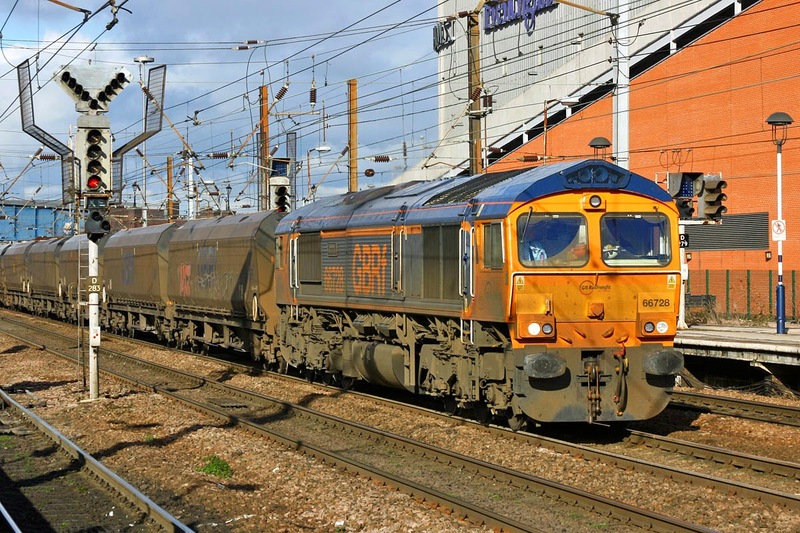 66715 VALOUR came through half an hour later, with 6G15. 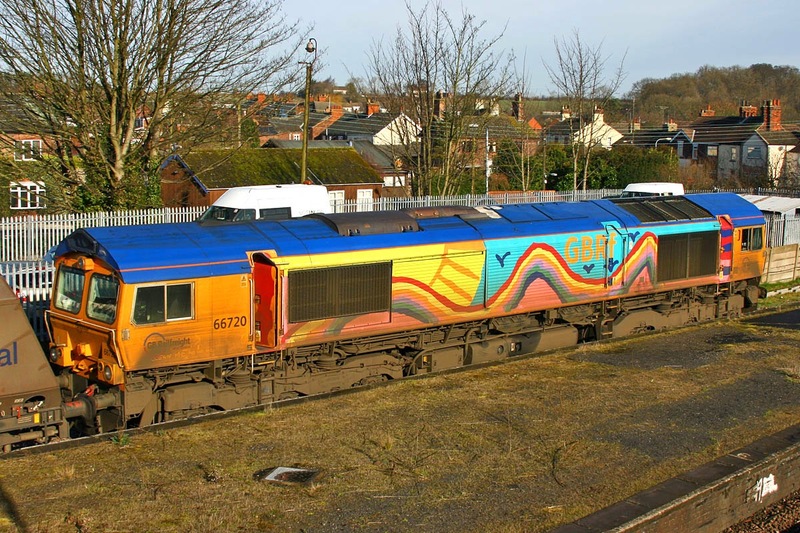 Still in original GBRf colours, 66715 was built in April 2003. 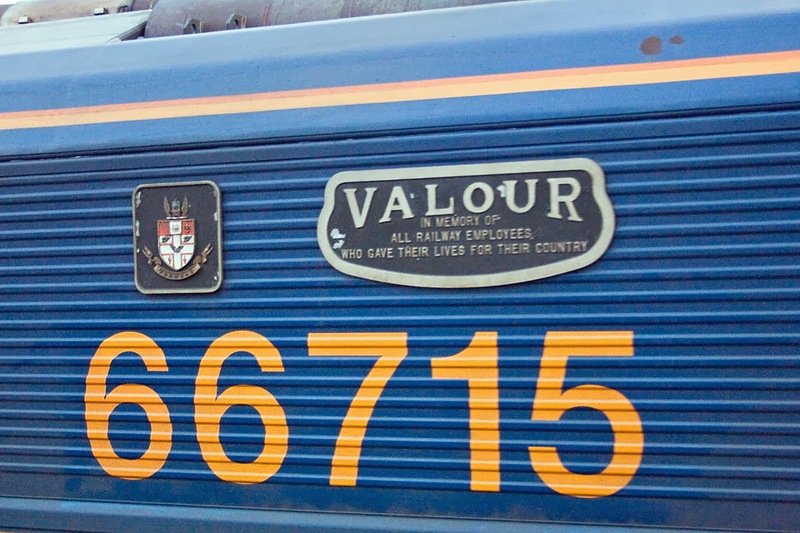 The first Valour was a Great Central Railway Class 9P (LNER B3), and the GCR crest is seen here, reflecting that heritage. The general manager of the GCR at the time was Sir Sam Fay, who spent his later years at Awbridge Danes near Romsey, so it appropriate to see this heading towards Dunbridge today.